We’re all aware that our time on this planet is limited. It’s an undeniable, yet liberating fact about human life. be our best possible selves, and so on. To achieve success and improve our lives, we’re trying to optimize the limited time we have. At the start of 2018, many of us would have made New Year resolutions for the year in the hope to change an undesired behavior, achieve a personal goal, or otherwise improve any other aspect of our lives. We make them to serve as a personal roadmap in meeting the goals for the next 12 months. In this blog post, we’ll focus on how you can achieve your new year resolutions by following and applying conversion rate optimization principles. At VWO, we champion the idea of following conversion rate optimization as a structured, methodical process. Over time, CRO experts and practitioners have realized that being methodical and data-driven in your approach can increase the propensity of success manifold. Without it, you’re just shooting in the dark, hoping for something to stick. Similarly, if you follow a framework for optimizing your life (read: achieving your new year resolutions), the chances of your success will increase. The first step of the Conversion Rate Optimization process is to identify key areas of improvement by tracking your visitors’ behavior. You begin with analyzing the quantitative data you have available from tracking goals and funnels. And use this to pinpoint what parts of the conversion funnel needs fixing. This data tells you where customers are dropping off in your conversion funnel. Next, you look at the qualitative data available from your visitors’ visual behavior analysis, website surveys and form analytics, to figure out the reason why your they are dropping off. Only when you know what needs fixing, can you go ahead and plan to fix it. Which is why research is the most crucial step of your conversion rate optimization process. The more thorough and comprehensive your research, the better your chances of success. 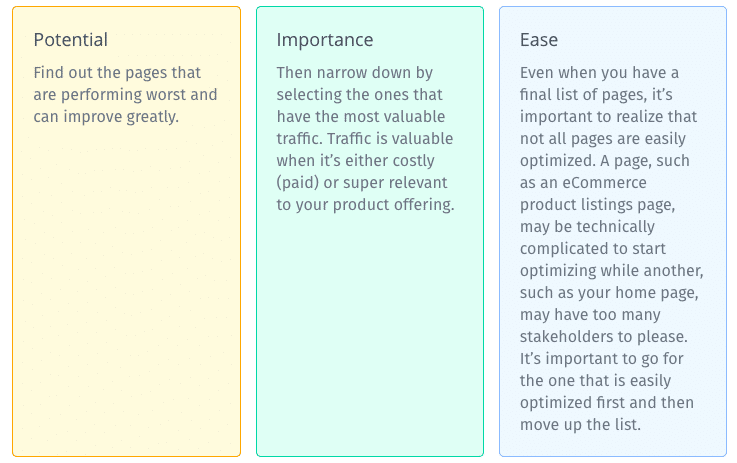 The first step in the CRO process is finding what to improve. Similarly, the first step in setting new year resolutions for yourself should be to identify what habits, behaviors, or aspects of your life you wish to change. For this, you’ll have to rely on the corresponding empirical information about yourself you already know. Consider this example: for the previous year, you have been running low on money at the end of every month. You now know the where of the problem. The reason being, the exorbitant shopping and regular cafe-hopping, among many others. This gives you the probable why of the problem. With this information available, you are now aware of one aspect of your life that you can improve. Apply the same to figure out more in a similar manner. After the research is complete, you’re able to identify the pages that have the highest drop-off. And hence, the highest scope of improvement. Per this information, you should be able to construct a hypothesis about what changes to your pages or funnel can bring about a desired change. Here’s an example of a good hypothesis: I believe moving trust signals closer to the billing form will result in 5% more checkouts because it instills confidence in the payment gateway. From the research phase, you can glean enough information to make an educated guess about the changes you can make to your life and their possible impact. I believe freezing 20% of my monthly salary in advance will result in having adequate money at the end of the month because I won’t be making unnecessary expenses. Similarly, you can create more hypotheses for your new year resolutions, based on the areas of improvements identified from your research. After you have a number of hypotheses available, prioritize these as the next step. After you uncover areas of improvement for your funnel and create hypotheses for testing, you need to plan out your testing schedule. What do you test first? Depending on what you’re aiming to improve and the many ways possible for you to achieve it, you’d have created a number of new year resolutions, which you can go ahead and follow. However, not all new year resolutions would be created equally. Perhaps, you’d want to focus more on being physically fit than cutting down on your spending habits. Which is why you should prioritize. Just as it would make more sense to reduce drop-off on your eCommerce store checkout page first compared to the home page. You need to determine what new year resolutions you should focus on more. And then, aim to follow the plan through the end. After the hypotheses are created and prioritized, it is time to test these per the complexity of the change. By using A/B Test, Multivariate Test, or Split URL Test. 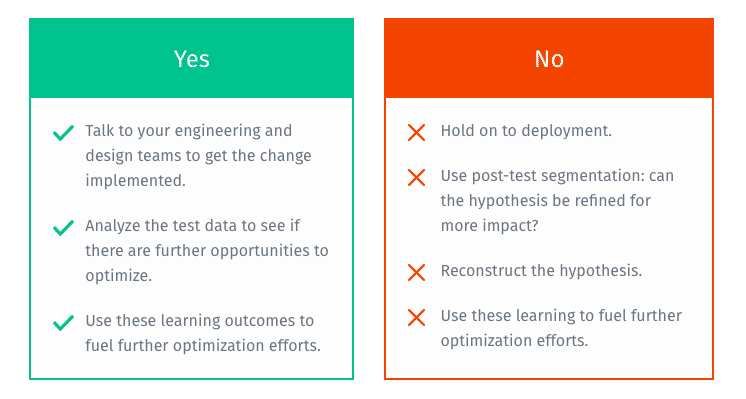 Testing helps validate or invalidate your hypothesis, else it can give you learning to implement in future optimization efforts. 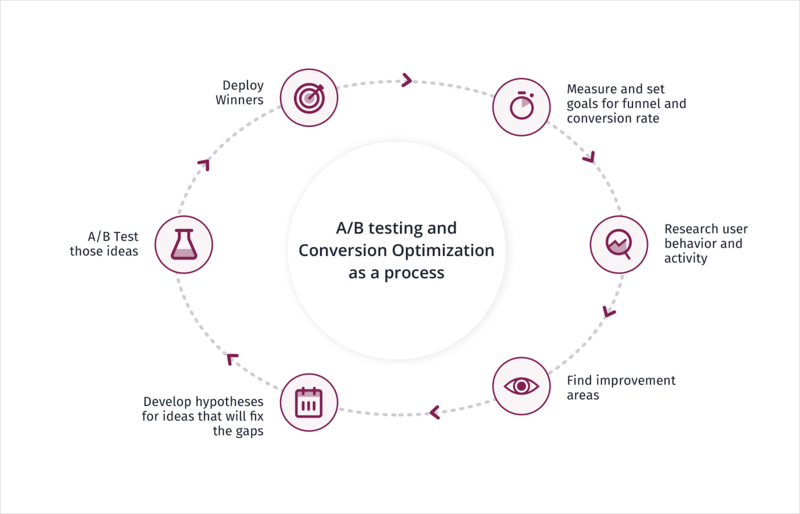 Thankfully, the operational aspect of your tests can be taken care of by an A/B testing software. Something which also comes built-in within VWO’s conversion optimization platform. By now, you would have prioritized the actions you need to take to achieve your new year resolutions. You should go ahead and implement these. You can track the progress of the results you achieved for fixed durations (say, two months), and see if these are close to the expectations. Save an amount that you would need by the end of the month, in a bank account other than your primary one. See if you are able to manage without having to spend it before the d-days arrive. In case the plan for improvement you have created is not helping, you should go back and create a new one, based on fresh research and analysis. Learning from your test results is the last but an equally important task as any other in your conversion optimization journey. If your hypothesis is validated, that is, your test is successful. You can now go ahead and implement the winning version on your live website. Also, share your learning with team members and other departments. If your hypothesis is invalidated, that is, your test has been unsuccessful. In such a case, jot down all the key learning points for future optimization experiments. Make sure you don’t repeat the mistakes, if any. 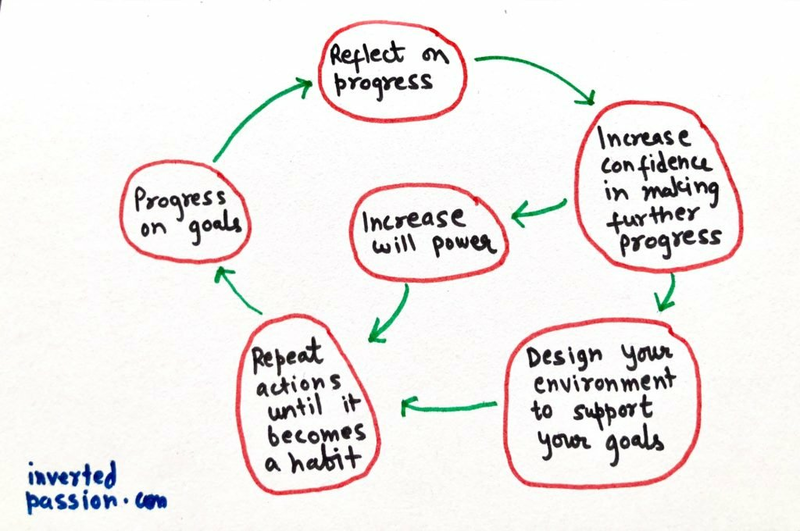 Based on the success, or the failure, of the improvement plan you’ve set yourself on, you should decide whether to follow it till the end, or to change things altogether while including learning from your efforts. Are You Ready to Optimize Your Life? Let’s face it. Following up on your new year resolutions, acquiring good habits, and so on is… tough, to say the least. It requires a whole lot of determination, will power, and focus to bring a drastic change in your life. As optimization and experimentation are our bread and butter, with this post, we aim to contribute our perspective on how you can achieve your new year resolutions, keeping in mind the concepts of conversion rate optimization. We believe you can follow the CRO framework to optimize your new year resolutions, and hence, your life. At the very least, you’d have experimented with something new and practical. Well, isn’t that what optimization is all about? Thanks for your kind words, Sateesh.